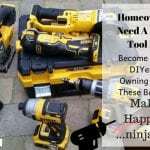 Home » Best Laser Level For Tilers In 2019 | Which One Do You Prefer? Last Updated: 2019.01.14 By Adrian B. So … you want to know what the PROS are recommending when it comes to what is the best laser level for tilers? Then, welcome, you are in the right place! Hello again ninjaDIYers and colleagues in the Construction Industry. 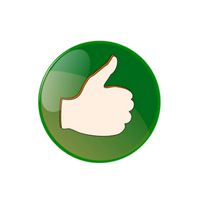 I hope you are all good and making lots of projects … why don’t you share with us what are you working on at the moment? Please leave a comment or join me on social media! This is an EXCELLENT cross-line laser level for tiling professionals like yourself. You’ll be more productive. It’s easy to set up which will allow you to work faster and finish more projects, making more money. Nice, right? This is what you want if you are a professional! My advice is that when shopping for laser levels and other construction equipment, the rule of thumb is, always seek second opinions and consult dealers and tool reviews for some insights. That’s why you should read articles like this one! Some construction projects such as laying tiles require the kind of precision that can only be achieved using a laser level. 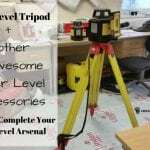 …Today I bring you a selection of three of the best laser level models available on the market. If you are a tiler and you might probably be wondering what is the best laser level for tiling walls or what could be a great flooring laser level, then look no further. I have all the information you need to allow you to make an informed choice. 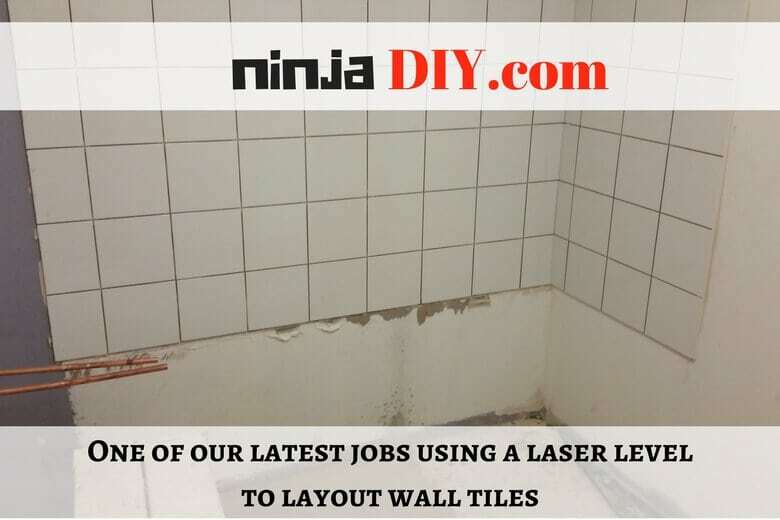 In this article, I will be scrutinizing some of the best leveling devices for tiling purposes that also offer great value for your money. 2 Which Laser Level Should I Buy For Laying Tiles? Lasers levels are perhaps the single most important pieces of equipment in any construction site or maintenance tasks. … so keep reading to find out what my TOP 3 choices are! Whether the task at hand is professional or basic DIY, laser leveling equipment have on many occasions proven their usefulness in projects that require flat, sturdy surfaces. 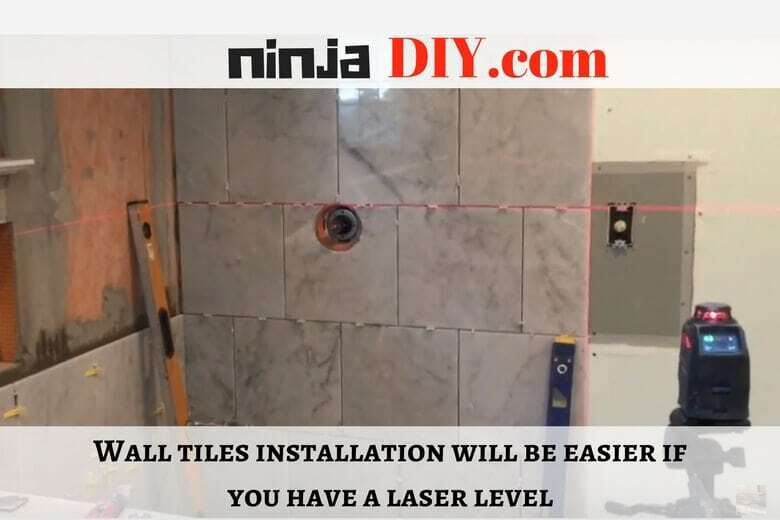 Just like in the picture below, we used a laser level to layout this wall tiles in a bathroom where later on you will have the plumber installing the bath just underneath our tiles. So it came quite handy a cross laser level for this job because we only had to set up the hight that we needed and … the rest was very straightforward. Laser leveling devices lower chances that errors in measurement and alignment will occur during tiling and other related tasks. Now, I know that many of you PROS out there have a divided opinion about using a laser level for tiling a wall or use the old trusty spirit level. Some of you, like the old school, using the old bubble level and the chalk line. …no matter what your view is in regards to using a laser level for tiling walls or floors … all of them admitted that it’s a great piece of kit to have in your toolbox. Which Laser Level Should I Buy For Laying Tiles? Depending on what part of the world you are right now you will have different brands available…but most of the professional tilers that I’ve talked to, most of them, they prefer either the DeWalt tile laser level or the Bosch GTL3 professional tile laser level. The models sampled are among the highest-rated models with respects to quality, ease of use and return on your investment and the best of all is that many of my colleagues are using them, so first-hand advice and reviews here! With great features like auto-leveling function and cross-leveling laser beams, this tool will make your life easier. It has an IP54 rating. Meaning it’s waterproof and debris resistant. That’s excellent since you can use it not only on small domestic projects but on big construction sites as well. Want to know what others are saying about this laser level? Click on the button below to find out! Many tilers would agree that this one could be the best flooring laser level! The DW088K is an excellent piece of laser for laying out floor or wall tiles, performing outstanding professional leveling tasks. It is designed and built by DeWalt; a world-leader in construction equipment. The DW088K’s quality is unmatched in its class. The device is most popular among professional tilers, carpenters, and electricians. 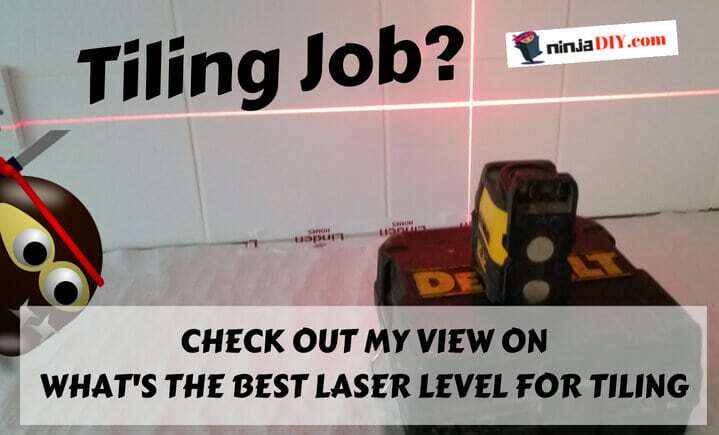 By the way, read here my latest article on what I believe to be the best laser level for electricians. Hobbyists have also taken quite the liking for this laser tool. 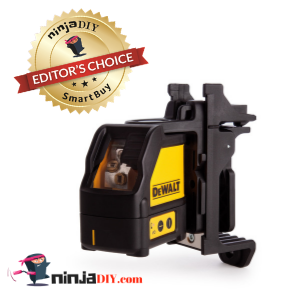 Since the DeWalt DW088K has only two buttons to operate the horizontal and vertical laser beams, it is not complicated to use even with novice tilers. The laser beams are bright enough and accurate to get the job done but get the job done right. The DW088K comes installed with a handful of features that improve the consistency of the final result. The DW088K laser level is ideal for both inexperienced users and professionals alike. As mentioned, it is suitable for tiling projects like wall or flooring tiles installation. The fact that the DW088K uses three standard sized AA batteries makes it quite popular with professional tiling experts and hobbyists as well. AA batteries are cheap and add to the versatility of this model. The accuracy and functionality of this model make it a popular choice for professional tilers. In many cases, this self-leveling laser level is the product that most PROs will choose. And it’s no wonder, we all know how DeWalt tools are…and to be honest I couldn’t hear any or too many serious complaints about this tool. The only drawback to an otherwise excellent laser level is that it doesn’t allow the user to secure the laser beam in a fixed position, a feature that is common and almost standard in other competing models in its class. Although the Huepar brand it's not as known as DeWalt or Bosch, these guys have built a great laser level for you. It has TONS of awesome features. For example, it projects GREEN laser beams that will increase the visibility of the laser lines. It makes it easier for you when you have to work in very bright areas. And it has much...much more! You must check it out! Click on the button below to find out more. The Huepar 901CG professional laser level is a well-engineered piece of equipment incorporating rubber as the over-mold material. The gaskets and seals in its housing also have rubber which raises its durability in the IP54 index. The device is termed by most professional tilers as the best in its class regarding reliability and performance. It is capable of sustaining a straight row of six-sided, one-meter off-ground drops without a loss in its functionality or accuracy. The device is self-leveling but also has a manual mode which is activated once the pendulum is unlocked by switching slides to an unlocked position. A green laser beam flashes when the tool is operating out of its optimal leveling range of 4°±1° to notify the user that the laser beam isn’t level. In this position, the device should not be used as a level reference. The Huepar 901CG makes use of German green diode technology, which is identified by the experts as the best laser technology in the word. Green lasers are twice as bright compared to red lasers with the same light source and power. This model’s light intensity averages at 14000lux with a visibility of up to 50ft. The 901CG boasts an ultra-bright 360-degree horizontal green laser beam. It provides all-around leveling coverage with an accuracy level of ±1/9 of an inch at 33 feet and a maximum range of up to 150 feet. The 901CG enables you to work in different lighting conditions both indoors and outdoors. The self-leveling time on this model is less than three seconds. The 901CG makes use of a sophisticated Cardan Suspension Pendulum system which means that the accuracy levels are dependable and suitable for professional tiling work. The Huepar comes equipped with a functional pulse mode. The default full-time pulse mode comes in handy with optimal duty cycle ratios that are modulated for indoor use of the device when powered on for the first time. It allows you to quickly spot the laser beams without taking notice of noticing the beam power dissipation that contributes to its brightness or visibility. In my findings, the Huepar 901CG’s accuracy levels are among the most impressive in tools competing in its class. It is a popular choice for tilers and other construction professionals. The 901CG has been reported in some cases suddenly going off without warning. Such interruptions can be quite costly if you are a PRO. Other than that ... not too many complaints. Overall ... not a bad laser level. The second 360-degree laser level on my list. This Bosch model it's TOP QUALITY. No more using the bubble level. Get the job done easier, faster and more accurate with this multi-plane leveling laser tool. Check out what the PROS are saying about this laser level on Amazon. Click on the button below! 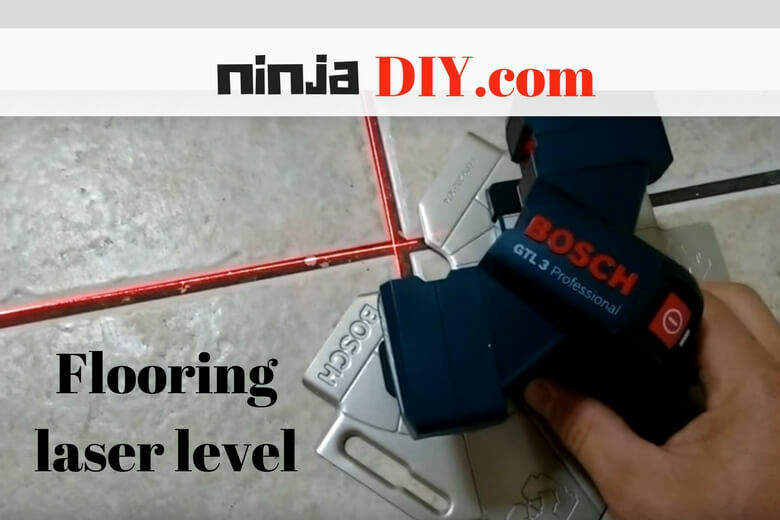 Probably the best 3 plane laser level for tiling floors. The Bosch GLL 3-80 p professional is a laser level built to meet professional construction standards. The self-leveling laser is easy to use even for inexperienced individuals making it popular with amateur hobbyists. Each button on the Bosch GLL is well labeled, and the warning lights convey explicit messages. The Bosch GLL 3-80 360° Three-Plane Levelling and alignment line laser tool provides a complete leveling solution without any rotating motors or moving parts. It allows the user to line up a level, align, square and plumb with one setup point by generating three 360° laser planes – one horizontal and two vertical. The Bosch cone mirror technology projects bright laser 'chalk lines' in 360°. With fewer moving parts, this laser layout tool is lighter, more compact, a great deal easier to calibrate and simpler to operate compared to traditional rotary lasers. The highly visible laser lines stay accurate using the Bosch GLL 3-80, because of Bosch's proprietary Smart Pendulum System. It performs self-leveling, indicates an out-of-level condition, and even locks when switched off preserving its accuracy over time. The lock also secures the pendulum for safe transport. The Bosch GLL 3-80 features a smart pendulum system that self-levels and indicates an out-of-level state. The device locks when switched off or not in use. A secure lock protects the pendulum when the device is switched off allowing safe transportation. In my research findings, the most significant selling points of this laser level are its durability and survivability with rough treatment and accidental falls from heights of up to one meter. For its price, the Bosch 3-80 is a grand bargain, suitable for professional leveling tasks in tiling projects. Here's another great product from Bosch. A very basic tool when it comes to what you can use it for. But if you are a busy tiler having all the tools that you need in order to be successful ... then get the GTL3. It will be a great addition to your tool arsenal! 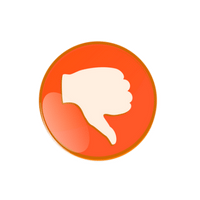 Check out reviews and opinions by clicking on the button below! In summary, laser levels are as crucial in tiling projects as they are in any other professional construction project. Settling on the right laser level takes some bit of searching, and with the right tool, you can be assured of high precision results and a worthwhile return on your investment. With the perfect laser level, you can turn your project into a smashing success. I hope that this article has helped ease your search for the best laser level for tilers. If so, happy days, if not ... shoot me a message or leave a comment and share your thoughts on the matter. This is what makes our community great!